Back when I first became a Christian in 1980, the devotional book ‘GOD CALLING‘ was very popular. This book was written in the 1930’s by two women who referred to themselves as “Two Listeners” because they sat and listened, waiting for God to speak, and they would write down what they believed God was saying to them. It’s popularity emerged again in the early 1980’s and many Christians began reading it. My friend encouraged me to get it, but when I heard how this book came about, God gave me discernment to realize that what these women had been doing was the very occult practice of ‘automatic writing’ that I attempted to try (and failed at, thank God!) back when I was a young teen dabbling in things that captured my curiosity. (More on that in another post I will write at some time in the future –Lord willing). I couldn’t understand why anyone would want to settle for a counterfeit when they already have the real thing –God’s Word, the Bible. 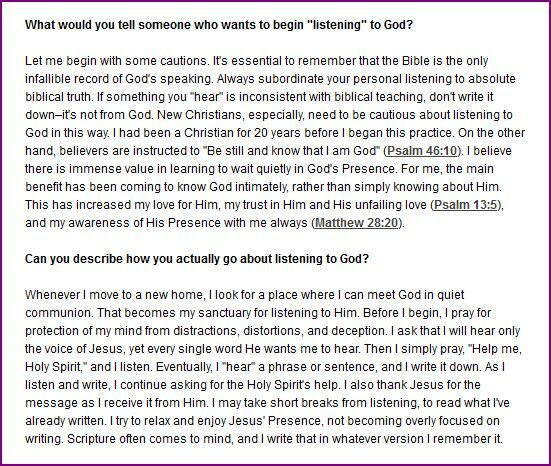 In the very first sentence of the ‘quick capture‘ above, even though Sarah gives some strong words of caution concerning “listening” to God, when you listen to the video I posted below you will realize that she did not test the spirits and the words of this ‘Jesus’ who spoke to her. Also notice how Sarah Young capitalized the word ‘Presence’ in the last sentence of the ‘quick capture‘ above, thus going beyond Scripture itself by implying Jesus indeed is speaking to her, and in doing so, she has added to the very words of God when the Canon of Scripture is now closed, and she is going contrary to Scripture by going beyond what has been written. (1 Corinthians 4:6) Without discernment, books like this will only cause many to abandon Biblical truth and to seek after ‘experiences’ with God. If we yearn to hear Jesus speak to us, why would we even desire to read any devotional book when we have the Bible –the very God-breathed Words of God Himself?! Have so many people who claim to be Christians today lost the appreciation and amazement of the fact that we have the very Words of God recorded for us in the Bible –the Book that many people willingly fought for and gave their lives for? Are so many today willing to settle for a counterfeit because they do not test the spirits and desire to seek after something new? I ask that you please pray for discernment and consider taking the time to listen to what Warren Smith has to say concerning ‘JESUS CALLING‘ in the video below, and test what he says in light of Scripture as we are to do when listening to anyone claiming to speak truth to us. We as Christians need to pray for Sarah Young, as well as for all those who, for some reason, find the need to read a devotional instead of God’s Word, the Bible. Also, as you are considering the gifts you will be giving to friends and family this Christmas season, consider giving the book, ‘ANOTHER JESUS CALLING‘ by Warren Smith, to those who have been captivated by reading this spiritually misleading book, ‘JESUS CALLING.’ Or at least warn them about it by sharing the following videos with them. Spiritual deception is growing rapidly these days, and those of us who are true followers of Christ need to be aware of these things, and warn others so they will not be led into deception. Thank you for stopping by, and taking time out of your busy day to read some of my posts and poems. 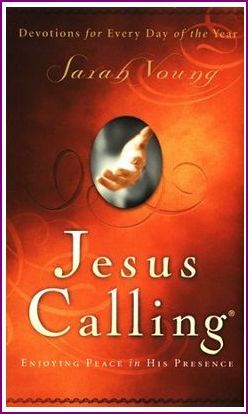 Warren B. Smith’s new book, ‘ANOTHER JESUS CALLING’ has just been released. 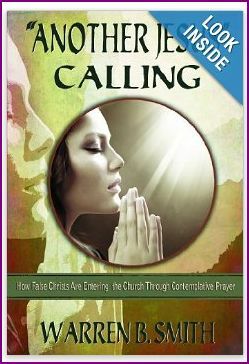 BOOK REVIEW BY SARAH LESLIE – HERESCOPE BLOG – OF WARREN B SMITH’S BOOK –‘ “ANOTHER JESUS” CALLING’ – WHICH JESUS IS CALLING ON YOU?